PORT-AU-PRINCE, Aug 20 (IPS) - Government authorities in Haiti face recent criticism over allegations that they continue to jail political dissidents. On Aug. 7, Amnesty International called for the release of Ronald Dauphin, a Haitian political prisoner. Dauphin is an activist with the Fanmi Lavalas movement of former President Jean-Bertrand Aristide. He was seized by armed paramilitaries on Mar. 1, 2004 - the day after Aristide's government was ousted in a coup d'état. According to Amnesty, "the delay in bringing Ronald Dauphin to trial is unjustifiable and is politically motivated". The organisation "opposes Ronald Dauphin's continued detention without trial, which is in violation of his rights, and urges the Haitian authorities to release him pending trial." Amnesty noted that Dauphin's health has deteriorated severely in Haiti's National Penitentiary, which is notorious for the appalling conditions to which it subjects inmates. One of Dauphin's co-defendants, Wantales Lormejuste, died in prison from untreated tuberculosis in April 2007. In May 2009, doctors examined Dauphin and called on the authorities to immediately transfer him to a hospital. But today, nearly five and half years since his original arrest, he has not seen his day in court and remains locked up. Demonstrations in downtown Port-au-Prince, with hundreds of supporters, occur here on a weekly basis, calling for the release of political prisoners. They are organised by local grassroots groups such as the Kolektif Fanmiy Prizonye Politk Yo, Fondasyon 30 Septanm, Organizasyon AbaSatan, and the Group Defans Prizonye Politik Yo. At one protest, Rospide Pétion a former political prisoner and Lavalas supporter, told IPS, "It is unjust to keep Dauphin in prison while criminals are on the street working without prosecution. We ask for justice for Ronald and all the unknown political prisoners from the slums." Last year, the Inter American Court of Human Rights (IACHR) ordered the Haitian government to immediately improve prison conditions. That ruling also ordered the Haitian government to pay 95,000 dollars in damages to Yvon Neptune, one of Ronald Dauphins co-defendants, for numerous violations of his legal rights. The Haitian government has disregarded the ruling to date. Neptune received a "provisional release" in 2006 after spending two years in prison but the case against him has yet to be dismissed, despite an appeals court order in his favour. Ronald Dauphin is the last of 16 Fanmi Lavalas members and supporters imprisoned based on allegations made by the organisation Réseau National de Défense des Droits Humains (RNDDH), as well as some relatives of the victims, that a massacre was perpetrated between Feb. 9 and 11, 2004 in St. Marc, 100 kms north of Port-au-Prince, Haiti's capital. RNDDH received funding from the Canadian government for the prosecution of the supposed perpetrators of the massacre. However, U.N. investigators - despite U.N. hostility to Fanmi Lavalas and support for the coup-installed government that ruled Haiti until 2006 - have not backed the accusations made by RNDDH. In 2005, the U.N. Human Rights Commission's independent expert on human rights in Haiti, Louis Joinet, concluded that what happened at St. Marc was that armed groups -supporters and opponents of the Aristide government - clashed and that there were casualties on both sides. In 2006, Thierry Fagart, head of the Human Rights department of the U.N. peacekeeping mission in Haiti, rebuked RNDDH for never substantiating its allegations by even providing a list of the names of the victims. Amnesty International's appeal on behalf of Ronald Dauphin also called for an impartial and thorough investigation into the events that took place in St. Marc, and it observed that "The investigating magistrate has only focused on the alleged crimes committed by the group supporting former president Jean-Bertrand Aristide and failed to identify the victims among the former president supporters and their alleged perpetrators." In July, the director of RNDDH, Pierre Esperance, told IPS, "In our system, the criminal becomes a victim because the system doesn't work." Brian Concannon of the Institute for Justice and Democracy in Haiti (IJDH) agreed that the shortcomings of Haiti's legal and prison system punish the innocent and guilty alike. However, Concannon noted that the coup-installed government of 2004-2006 "arrested hundreds of political opponents, some at the insistence of RNDDH. Over five years after the arrests began, not a single political prisoner has been convicted of any crime." "Some were acquitted at trial, like folk singer Annette Auguste 'So Ann', or cleared by an appeals court, like activist priest Rev. Gérard Jean-Juste, when the prosecution was not able to submit a shred of evidence. Many more remain in prison, or in legal limbo like Yvon Neptune." On Aug. 9, former President Bill Clinton, now a U.N. envoy to Haiti, addressed influential Haitian émigrés gathered at a luxury resort in Sunny Isles Beach, Florida. Working class Haitian activist groups like Veye-yo, which is based in Miami, have been calling on Clinton to work on behalf of Ronald Dauphin as he recently did on behalf of U.S. journalists imprisoned in North Korea. A group of Veye-yo activists assembled just outside the resort calling for such action. Momentum has been growing for Dauphin's release. Evel Fanfan, a Haitian attorney for the Association des Universitaires Motivés pour une Haiti de Droits (AUMOHD), also speaking at the recent gathering in Florida, expressed firm solidarity with the campaign to end illegal detentions such as that of Dauphin. 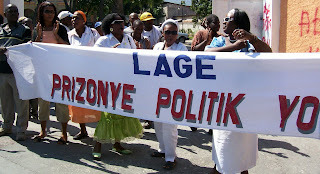 The Haitian government denies that it holds political prisoners. Haiti's ambassador to the United States, Raymond Joseph, denying that he has even heard of Dauphin, says, "There are no political prisoners in Haiti. The fact that Neptune and the others are out of jail and they were the most prominent and that this person... is still in jail, to me underscores... some people are in jail but not for political reasons, but since they belong to a certain party they are shopping this around and saying 'its because I belong to this party that I'm in jail'". Others argue this is part of a pattern, part of a concerted campaign to silence Haiti's poor that continues today with the blocking by the government's Conseil électoral provisoire (CEP) of Fanmi Lavalas from taking party in recent elections. Speaking last Wednesday on Free Speech Radio News, Pierre LaBossiere, a founding member of a North American-Haiti solidarity organisation, the Haiti Action Committee, said, "We have petitions to President René Préval to free the political prisoners. People shouldn't be in jail because of their political beliefs." "Because of their strong feelings that President Aristide is the true spokesman for their aspirations they were put in jail on trumped up charges, never a day in court and they are sitting there for years," he said. In May, U.S. Representative Maxine Waters wrote to Haitian Prime Minister Michèle Pierre-Louis and Secretary of State Hillary Clinton, warning that the failure to provide adequate medical treatment to Dauphin could "cause the injustice [of illegal imprisonment] to become a death sentence." Dauphin learned about Amnesty's statement on his behalf while listening to a radio interview that his attorney, Mario Joseph (of the Bureau des Avocats Internationaux), was giving about his case. Dauphin's wife told IPS, "Ronald was pleased when he heard the news on the radio". However, she remains distraught over her husband's situation. His ailing mother, Janne, who is 78, is also suffering immensely wondering what will become of her son.